http://www.downtownkc.org/wp-content/uploads/2017/05/DowntownKC_Logo_REVoutline.png 0 0 Ann http://www.downtownkc.org/wp-content/uploads/2017/05/DowntownKC_Logo_REVoutline.png Ann2010-10-11 15:35:542018-04-22 23:44:10International Downtown Association Annual Conference: An Award Winning Experience! Yellow Jackets! Bumblebees! The Downtown Community Improvement District Ambassadors Are Working Hard For Kansas City! Since the spring of 2002, the Downtown Community Improvement District (DCID) Ambassadors have been making Downtown a safer and cleaner place to live, work and visit. When the River Market established its own CID in 2004, the Ambassadors were picking up trash, removing graffiti, patrolling bus stops and parking lots (among many other services) across the 200 blocks in both districts. Then, in 2006, the CIDs expanded their services by establishing a Green Team that maintains landscape beds and mows grass throughout both districts. http://www.downtownkc.org/wp-content/uploads/2017/05/DowntownKC_Logo_REVoutline.png 0 0 Mark http://www.downtownkc.org/wp-content/uploads/2017/05/DowntownKC_Logo_REVoutline.png Mark2010-10-04 14:02:582017-08-08 16:40:00Yellow Jackets! Bumblebees! 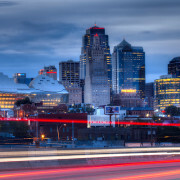 The Downtown Community Improvement District Ambassadors Are Working Hard For Kansas City!